A new science-fiction role-playing game has appeared on the scene, called HC SVNT DRACONES (a variation on hic sunt dracones, or “here be dragons” in Latin). “HC SVNT DRACONES puts you in the body of a human experiment that outlived its creator, and has gone on expanding into the galaxy while trying to heed the lessons of a race that fell to ruin. It’s about exploration and fear, expansion and conquest, intrigue and subterfuge, and ultimately, it’s about you, learning to be you, when all the trappings of humanity you define yourself with are dead and gone. A unique character generation system allows you to assemble you Vector layer by layer, from their family to their species to the unique anatomy that defines their appearance. Interact with your story on two legs or four, from 6 feet up, or less than one. Explore new character interactions and problem solving possibilities when your party can range dramatically in size and shape from person to person.” After a (very!) successful Kickstarter campaign by HSD creator Pierce Fraser, the game manual is available now as a download at Drive Thru RPG — with the hardcover edition soon to follow. Also, make sure to check out HSD’s official page at Tumblr for updates. 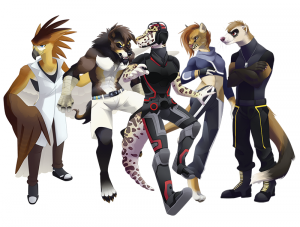 Ultimum is another new electronic game system of more than passing furry fandom interest which is seeking development funds through a Kickstarter campaign. Created by Christian Muckler and his associates, Ultimum seeks to recreate the playing environment of a traditional tabletop fantasy role playing game — not only in a paper tabletop setting, but also as a virtual on-line “sandbox”. We should also note, of course, that the game includes several non-human playable races it its science fiction setting — Including humanoid bears, wolves, lizards, and gorillas. The Ultimum Kickstarter page includes several development videos as well as an animatic “game trailer”. 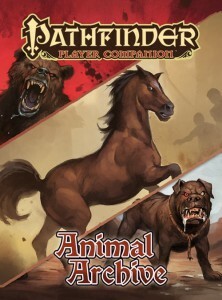 If you play the FRP game Pathfinder, don’t go it alone: Bring along one of many new animal companions to help you out. “It’s time to level up every adventurer’s best friend with Pathfinder Player Companion: Animal Archive. This player-focused guide to animal allies, steadfast steeds, and fearless familiars unleashes a host of options for everyone’s favorite companion creatures. Take your pick of new options for heroes, including new opportunities to give any class access to animal allies, new tricks to teach all manner of beasts, and a host of savage new archetypes, spells, equipment, and magical items. Or take your pick from any of a variety of new creature compatriots, whether it be one of Golarion’s numerous native animals, a choice from the comprehensive list of animal familiars, or one of an assortment of new creatures specifically designed as adventuring companions. 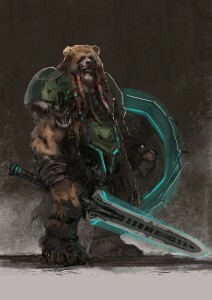 An assortment of feats and archetypes for animals also gives your ally the edge over every other bestial bumpkin in the wider wilds. 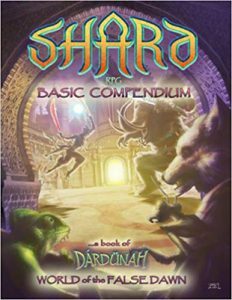 Don’t let druids and rangers be the only ones with an advantage, adopt your perfect furred or feathered, tailed or scaled ally with Pathfinder Player Companion: Animal Archive.” Look for this new illustrated trade paperback in January, or pre-order it at Amazon. Beyond Belief Games have packaged three of their most popular RPG game systems in a single paperback edition. 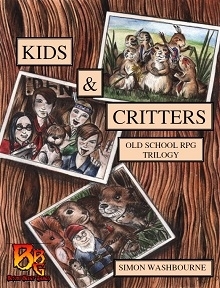 The press release for Kids & Critters (edited by Simon Washbourne) goes like this: “Bringing to mind stories like Watership Down and Duncton Wood, the fabulous Tales from The Wood is a great role playing game for all ages. Lashings of Ginger Beer sends you back to Idyllic England, where nosey kids investigate real and imagined crimes, in the great tradition of Enid Blyton. Finally, we have the unusual but brilliantly charming It’s a Dog’s Life; definitely the best prairie dog role playing game ever.” Kids & Critters is also available for download (at a very low price) as a watermarked PDF file at rpg.drivethrustuff.com. Monsters are your Best Friends! There is no way we can describe Monsters and Other Childish Things better than the publisher: “Monsters are real. You know because you have one. He’s more fun and way tougher than all the other kids’ monsters. Try not to let him eat your friends. Monsters and Other Childish Things is a distressingly fun and funny role-playing game about kids and the relationship-devouring horrors from beyond time and space who love them. 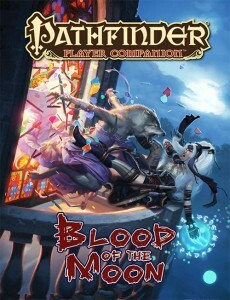 Players take the roles of ordinary kids whose best friends are slavering monstrosities from beyond time and space — and that’s already enough to get them in all kinds of trouble with parents, school principals, friends, the Monster Investigation Bureau, mad science teachers, wannabe wizards, you name it. Can you make it through a school day without having to explain why your monster ate the substitute teacher? We’ll soon find out. Monsters and Other Childish Things: The Completely Monstrous Edition is a 180-page, monstrously-complete role-playing game.” It’s also available as a 264-page digest-sized paperback edition, from ArcDream.com.